It’s almost here! On October 22, Heinemann will publish The Teacher You Want to Be, the book that grew out of a 2012 study tour to Reggio Emilia that Matt Glover and I organized. The tour gathered together a group of educators to visit Reggio’s world-famous pre-schools and their new elementary school. We used our observations to jump-start some meaningful conversations that would broaden our thinking about the teaching of literacy. Our group discussions while we were in Italy, both with the teachers and parents from the Reggio schools and by ourselves in the evening, were thought provoking and exhilarating. We returned to the US determined to keep the conversation going among ourselves and with the public. All of the participants were invited to write personal reflections on their trip experiences. These reflections formed the basis of our Statement of Beliefs, thirteen beliefs describing how children should be learning and how schools and educators can best approach teaching. Each belief is quite descriptive, dealing with what we see as the major issues challenging American education. Heinemann then got on board and decided that these beliefs were so important that they deserved to be reflected upon by some of our most important minds in education and shared with the public. Now we are almost ready with the final product. 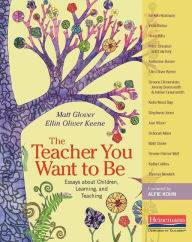 The Teacher You Want To Be is a beautiful publication, edited by Ellin Keene and Matt Glover, with an introduction by Alfie Kohn. The book consists of essays written by study group participants (Kathy Collins, Vicki Vinton, Stephanie Jones) and by Katherine Bomer, Deborah Meier, Sir Ken Robinson, Peter Johnston and Gay Ivey, Heidi Mills, Ellin Keene, Dennie Palmer Wolf, Tom Newkirk, Katie Wood Ray, Jose Vilson, and an interview with Simone Dinnerstein, and Jeremy and Adrian Greensmith (my grandson!). This publication was lovingly nurtured from beginning to end by Vicki Boyd and Zoe Ryder White. I’m so pleased to share the Statement of Beliefs with you and hope that you are as excited as I am to read the essays that these beliefs inspired. I hope that teachers and administrators, book discussion groups, college education classes and anyone interested in improving the state of education, will read this book and keep this vital discussion alive. We believe that teachers are researchers and that instructional decisions are best when based on what teachers have learned and documented by observing and listening carefully to students throughout the day. The decision of what should happen in a classroom each day can best be made by teachers who know their students well. Teachers are researchers, engaged in a pedagogy of authentic listening and observation, using what they learn from students today to influence what happens tomorrow. These decisions should be made with intention and with a strong belief in the rights of children to use natural learning strategies such as storytelling and wondering. Teachers, not programs, should make instructional decisions for children. Increasingly we see schools where the expectation is that all students be taught the same thing, same day, at the same time. How can we realistically expect students across classrooms (or even within a classroom) to have the same needs, and therefore, be taught the same lesson at the same time? Even within one classroom, there is a range of abilities and interests. We should expect classroom instruction to recognize and reflect this range of abilities and interests. Education that is “standardized” is not responsive to unique human beings who have particular strengths, gifts, interests and challenges. We believe that the way teachers approach their own learning should parallel the way children approach their learning, and school is the place where both teachers’ and students’ learning is characterized by engagement, purpose, and self-direction. We believe educators should have a positive and expectant view of children, with an understanding that children enter school with personal histories and particular strengths that teachers should recognize and use as the foundation for working with them. Educators should have an appreciative view of children. Children should be viewed through a lens of strengths rather than deficits and next steps should be based on where they are at that particular moment. Naturally, there will be a range and the pathways to learning will need to be differentiated. Teaching decisions and instructional decisions should be based on a child’s current development, not on the pacing calendar of a program. Successful learning environments are predicated on the teacher’s knowledge that the vast majority of children don’t benefit from being labeled and grouped. This labeling promotes a “bell curve” mentality in adults. Children are all too aware of where they fall on the curve. Intellect isn’t something we’re born with. It’s something we develop alongside intellectual mentors, both teachers and other children. We increasingly see educational decisions and curricula that assume all students have the same needs and are in the same place in their learning at one particular time. This thinking, combined with high stakes tests and rigid pacing calendars, leads to a deficit view of children and teachers. School communities should engage in a process of value articulation and have regular opportunities to check practice against those values. Time should be taken to consider these goals as a community and to support one another in continually revisiting their image of children. We believe children, families and teachers should see challenge, struggling, and mistakes as positive, creative opportunities for learning and growth. Students and teachers should understand that much learning is involved in the approximations any learner makes toward an ideal practice. When children engage in learning that is meaningful, challenging, and in their zone of proximal development it will lead to children encountering challenges and difficulty, and also works towards understanding. Struggling is a synonym for productive learning as long as the struggle is not overwhelming. The key is to create educational experiences that aspire towards high levels of challenges in environments where children feel comfortable enough to make mistakes. Neuroscience is clear that optimal environments for learning support a state of relaxed alertness in which the brain is most open to making new connections. This research supports the need to focus on social and emotional intelligences to develop other kinds of intelligences. True inquiry and deep thinking assumes that answers and understanding will not always come easily, and that approximations should be welcomed and honored. Too often, teachers try to make learning easy for children, presenting materials and lessons that don’t challenge students to problem-solve or think out of the box. This can lead to learning environments where the goal is primarily getting a right answer rather than one that supports critical and creative thinking that allows and encourages children to take risks while working out challenges. If our goal is to support deep understanding, then students need to have opportunities to think deeply over sustained periods of time. We believe students desire and have a right to autonomy, self-direction, and choice in their development of lifelong learning and engaged citizenship, and that teachers should design learning environments that foster rich opportunities for engagement. Human beings are prewired to explore. Curiosity is a natural state of mind that drives the need to be in relationship with and make meaning of the world around us. School should be a place that supports the sustaining of such habits of mind. Environments should be designed to foster opportunities that support and encourage this disposition. When teachers provide space and time for children to independently problem-solve and orchestrate their strategies for self-chosen purposes, children learn how to transfer what they’ve learned in school to outside of school situations. They become flexible learners who can apply understandings and strategies both in and out of school. The mere acquisition of skills can occur with low levels of engagement, but the skills will not be as firmly embedded if students aren’t engaged in their learning. Increasingly, we see educational systems that promote the attainment of skills solely for the sake of attainment. Students see little meaning of relevance towards long-term intellectual growth. Disengaged children often view schoolwork as something that doesn’t easily cross the border between the school day and their every day lives. We believe both teachers and students should share ownership of the learning experience, whereby they collaboratively make meaningful decisions that impact the course of learning day by day. This belief isn’t meant to naively suggest that we’re calling for hands off teaching. Quite the contrary. When teachers believe that children are capable of deep thinking and problem solving, they are more willing to share ownership and control of learning with students. Children then develop a sense of agency and a belief that they have important thinking to contribute. There should be a balance of ownership in the classroom that can occur only when actively engaged teachers are willing to trust in the innate abilities of children and share the learning process with their children. The learning process in schools is often controlled by the teacher, the program, and/or the curriculum, leaving little opportunity for children to have any ownership or control over their learning. Instructional pathways that are predetermined for large groups of children allow for few real choices and decisions on the part of the children, and therefore encourage passive, rather than active, learning, and send the message that “learning” is something that one cannot have control over. In life we need individuals and groups to be excited about pursuing different interests and passion. If schools promote conformity and sameness, why would we expect adults to behave any differently? We believe children have a desire to interact with challenging questions and inquiries of real importance to themselves, to their community, and to the world. Children of all ages, even very young children, have the capacity to chew on big questions and are continuously making theories, whether we ask them to or not. By creating environments that support habits of research and collaboration, children will develop attitudes that allow them to sustain a sense of wonder, value multiple perspectives, and develop an increasingly sophisticated capacity for critical thinking and innovation. When students are in environments where they are encouraged to ask and pursue meaningful questions, their learning is deeper and more likely to transfer between home and school and across content areas. Elevating the scale of children’s work from isolated tasks to authentic, significant projects that matter in their lives and communities increases the probability for meaningful learning. Children quickly realize the difference between meaningful, authentic learning situations and contrived situations that only serve the purpose of acquiring a predetermined skill. When schools frequently focus on controlling bodies rather than fostering intellectual growth, school experiences are pushed toward that of discipline, punishment, and compliance rather than questioning, engagement and intellectual growth. The goal of curricular programs and resources should be to stimulate independent thinking, deep and complex questioning and problem solving. We believe that learning is based in relationships, and that interactions between teachers, families and students should be joyful, compassionate, and authentic. School should be a place of wonder, joy, intellectual risk-taking and well rounded fun. The sounds of a classroom should include a balance between teacher and student voices, laughter, and conversations, both formal and informal. We’re not suggesting classrooms without structure or planning. Instead, we believe the learning environment should be joyful and fun because those are conditions that encourage academic risk-taking, vibrant interactions with others, and higher levels of engagement. True learning and deep understanding are often the byproduct of a joyful learning environment. We increasingly see schools where the experience for teachers and students is primarily one of assessing, evaluating and sorting. In these situations students may reach external benchmarks, but at the unfortunate cost of growth and development, connection and community. We believe that teachers develop professionally through meaningful inquiry and collaborative opportunities with colleagues, characterized by sharing observations of students, exploring instructional possibilities, and reflecting on their growth as learning teachers and teacher-leaders. Schools should be vibrant, stimulating and creative places that support creative thinking for teachers as well as for students, and to this end teachers must have regular and frequent opportunities built into their schedules to meet with colleagues and other professionals so that they can collaborate, reflect and explore the implications of what they’re observing in their classrooms. Professional development is then self-directed and collaborative making use of critical friends as they take an analytical stance towards both learning and teaching. Because learning is socially embedded for all humans, we should build up opportunities for educators to work together as a way to support professional development. Too often teachers’ planning time is spent on the minutia and paperwork that supports a system built on data and accountability, rather than on the needs of children. Additionally professional development time is often devoted to training teachers to implement a program rather than on building their own capacity as thinkers and learning designers. Many researchers have identified capacity building as a critical factor in creating meaningful learning for students. We believe children grow theories about the world around them through their collaborations and interactions with one another. Children need constant opportunities for collaboration and social interaction. A socio-constructivist approach should be embedded throughout the school day. Spaces and routines should be organized to facilitate discussion and social interactions where children are engaged in a collective journey together. To often students look to the teacher for all of the answers, and frequently they are looking for a single right answer. Children should be encouraged to build on their collective knowledge and experiences as they become independent thinkers and learners. A central goal should be to facilitate learning and create an environment where, through collaboration, engaged children become dynamic thinkers and problem solvers who question, interpret, form theories, and find significance in the world around them. We believe positive and integrated relationships between families and educators are crucial and plentiful opportunities for collaboration among students, teachers and families are essential. Teachers should develop empathy for the struggle inherent in learning and work in solidarity with children and families. Children benefit when schools and families are harmoniously engaged in the learning experience. Learning occurs within relationships when connections are made between children, families, and educators. The tenor of the language schools and teachers choose to use is important and has the power to invite or exclude children and families from becoming enthusiastic participants in the world of school. We believe teachers have the opportunity to learn more about children’s ideas, experiences, and interpretations when we offer them multiple means of expression. We believe that all effective and engaging learning occurs through both the mind and the body. Cognitive thought is embedded in social and physical explorations occurring in inspiring environments. All learning occurs through the body. Constructive experiences engage the whole child, body and mind, hands and heart. Today we see learning, particularly deep, meaningful learning, as embodied, encompassing both thought and feelings. A carefully designed, aesthetically intentional environment plays an essential role in the social and physical engagement of the mind, body, and feelings. With a focus on narrow skill attainment, schools often lose sight of how learning occurs and neglect to foster student aesthetic, artistic, and social development. Children should be seen and nurtured globally due to the interdependence of all aspects a child’s development. We believe children need time, both within a school day and across a school year, to deeply explore topics of importance and interest. Learners of any age need prolonged periods of time to interact with ideas in order to become fully engaged with them. The time needed also varies from child to children. In order for children to become self-directed learners, children need to have ample time to work on long term projects, as well as have some control over how they spend their time. When children’s days are too fragmented it is difficult for them to stay with an idea if they don’t have the time needed for deep engagement. When the school year is too rushed, it is difficult for children to stay with an idea or project for sustained periods of time. How the school day flows should reflect what we know about child development and learning, not the artificial structures of pre-packaged curriculum and schedules. This entry was posted in Investigating Choice Time: Inquiry, Exploration, and Play and tagged Alfie Kohn, Deborah Meier, Dennie Palmer Wolf, Ellin Keene, Gay Evey, Heidi Mills, Heinemann, Jeremy Greensmith, Jose Vilson, Katherine Bomer, Kathy Kollins, Katie Wood Ray, Matt Glover, Peter Johnston, Simone Dinnerstein, Sir Ken Robinson, Stephanie Jones, The Teacher You Want To Be, Tom Newkirk, Vicki Boyd, Vicki Vinton, Zoe Ryder White on September 22, 2015 by Renee. I was recently asked by the P.S. 142 support network to write something about the inquiry work being done in the early childhood classes of their school. I thought that I would share this with you. Writing it down really did help clarify the work for me! I encourage your questions and thoughts on this topic! The inquiry project work that I have been doing at P.S. 142 is grounded in the research and practice of Lilian Katz, (former president of NAEYC and founder of the ERIC research center) and also in the work done in the early childhood schools in Reggio Emilia, Italy. ∗ Social and emotional skills are equally as important as academic skills and knowledge for student success and classrooms need to be flexible learning spaces that support and adapt to student needs. ∗ There should be a strong home-school relationship where children, teachers, parents, caregivers and the community are interactive and work together. In my work at P.S. 142, I have been encouraging the teachers to look and listen carefully to the children throughout the day. When we begin planning for our inquiry projects, the teachers and I first take a walk around the community, thinking carefully about what children see and experience in the world outside of school. We also discuss what inquiry project experiences children have had in the previous grades and how a new project will allow children to build on their new schema. 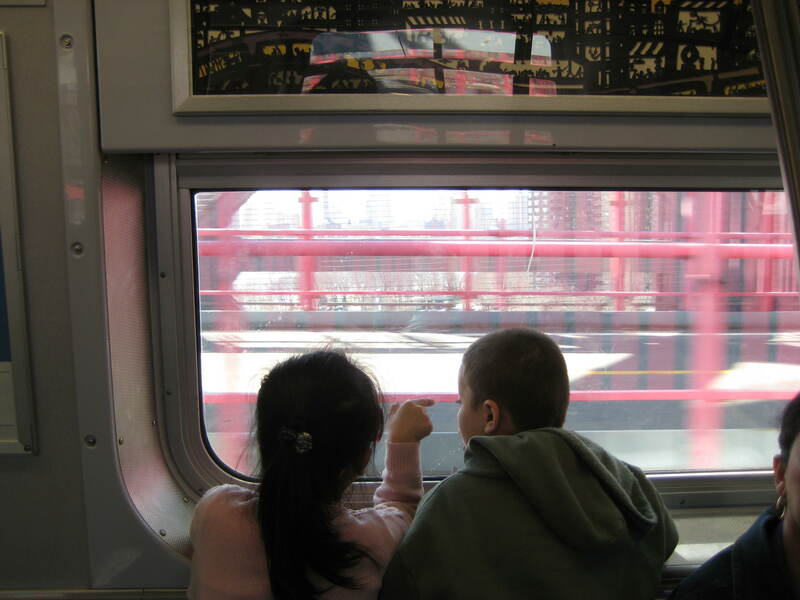 Therefore, children who have had the experience of in depth investigations of the Williamsburg Bridge and then the subway system can logically move on to an inquiry project that focuses on cars and car travel. Before beginning the project with the children, the teachers map out what we call an Anticipatory Web. This includes the possibilities for exploration on the topic, resources such as books, Internet sites, experts to be interviewed, and field trips to support the study. Possible activities across the curriculum are included. We look at the common core standards and discuss how they can be addressed through the project work. When the kindergarten, first grade and second grade children at P.S. 142 begin work on an inquiry project, the teacher always begins by brainstorming for all that the children already know on a topic. Often young children, particularly children with special needs, have difficulty articulating verbally what they know and so children have many opportunities to express their prior knowledge in many ways. They can draw a picture, create a model, act out or tell their story. We have found that if children can create an image of their ideas, then this acts as a support for them when the class meets to discuss and record information. 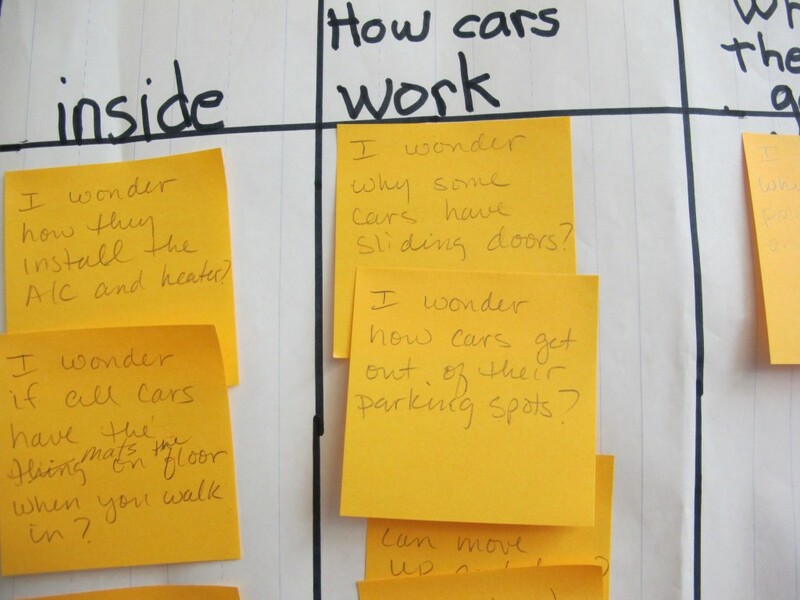 After recording their information on post its, the teacher will usually meet with a small group of children to begin organizing these notes into categories. A few of the post-its are read through together and discussed. Children think about which statements belong together. For example, in the Car Project, children might have said, “Cars have engines” “You can take a car to ride to the country” “Car drivers have to follow traffic rules” “There are seatbelts in cars” “Cars can go fast “I went to Coney Island in a car”. The small group might then organize these statements into these categories. ” HOW CARS CAN GO, WHERE CARS CAN GO, PARTS OF A CAR, RULES FOR CARS. This chart is then shared at meeting time and the entire class then completes this. Using a small group to begin makes the process more manageable for children who would lose focus when presented with too much information. Referring to this newly formed web, the class then begins recording their questions in the form of “wonderings. These questions will drive the investigation. This year, in one of the kindergarten classes, the teacher was having a difficult time engaging children in formulating important questions for investigation. Because this is the fourth year that she has been doing inquiry projects, she realized how important this step is in the process. Rather than come up with questions herself, she knew that the children’s involvement and curiosity were crucial to tap into. She came up with the idea of creating “research committees.” They had just started an inquiry project about firefighters. The teacher had already collected and shared the children’s drawings and stories about firefighters. She read a few books to them and had a toy firetruck in the classroom. She asked the children to help her list important things that they knew about firefighters and fire engines and listed this on a chart. Then children picked which one they wanted to research. Being on these ‘committees’ supported children in developing important questions! Last year the first grade began the year with a study of bridges. This was a natural choice based on the location of the school right along the ramp of the Williamsburg Bridge. When winter arrived, they moved on to a subway study, since, on their walks across the bridge, they had noticed the train traveling alongside them. Also many children rode the subway to school. In spring, however, they circled back to the bridge study, this time focusing on moveable bridges. By now, all of the children brought with them much prior knowledge from the first two studies of the year. When the class made a trip to the bridges over the Gowanus Canal, they had the exciting opportunity to stand on the Carroll Street retractile (swing) bridge as it opened. The teacher pointed out the gears and the tracks, relating it to all that they had seen when observing subways. The next day, back in one classroom, a group of children were building a moveable bridge. Before beginning they each drew a plan for the bridge that would be built. When the teacher came over to see the bridge she asked whose plan they used. One child who particularly has a history of acting out behaviors explained how they used “a little of his, a little of his, and a little of mines,” Collaboration was a major challenge for this child but because of the excitement of the investigation and building activity, and his engagement with the topic, he more naturally was able to rise to the challenge of cooperative play. Recently, one of the second grade classes, as part of their car inquiry project, went on a walking trip to visit the Municipal parking lot on Essex Street. Previously, they had walked through the neighborhood, carefully reading and interpreting the various street parking signs and the muni-meter. The teacher put money in the muni-meter and showed the children what the ticket that came out looked like. At the parking garage the children again observed and interpreted the various signs and symbols letting drivers know where to park, when, where and how much to pay, and when to stop and go. Each child had a personal “trip recording book” that included photographs of different parts of the parking garage. Before the trip they wrote predictions and questions that they would like answered. They took notes at the garage and had time to write reflections when they returned to the classroom. Back in the classroom, the children broke off into groups. One group went to the block area and began work on building a parking garage, putting up signs and symbols and adding toy cars so that they could role-play “parking garage”. Another child chose to work in the math center, using the pattern blocks to design cars. She recorded how she created her cars, using the symbols for the various shapes. A group of children went to the art center where they used recycled materials to construct cars – some realistic and some imaginary, such as the flying car made from an empty water bottle. After the completed their constructions, they wrote descriptions of the cars. Four children worked with the student teacher on researching some of the questions on the class “Wonderings” chart. They wrote their answers on post-its that they put over the questions to show that they have already been answered. Another group that consisted of a group of children who had more advanced mathematics and reading skills played “What’s The Rule” using a new game that included a set of “Cool Cars” cards. In observing the group, I was impressed with the way that each small group was working with a high level of focus, independence and engagement. I also noted that the teacher was able to maintain an atmosphere of play and also engage children in reading, writing and mathematics. 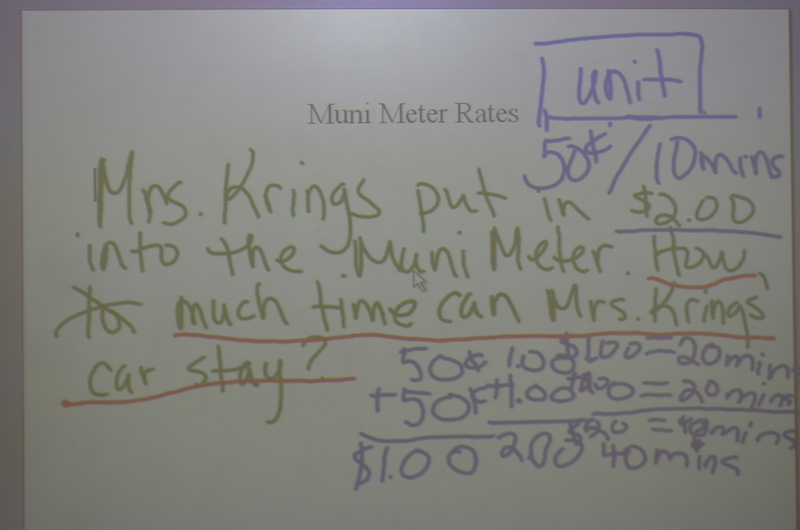 That afternoon, in the same classroom, the teacher used the muni-meter experience to generate a mathematics problem that the class solved together. She then asked the children to create their own muni-meter problem, write it up, solve it, show on paper how they solved the problem and illustrate their story. As I walked around the room with the teacher, I saw how she was able to use this one recent experience and allow all children to work at their own level of knowledge. Each child’s problem was validated and supported by the classroom teacher. Children were eagerly sharing their math stories with each other at their tables. ∗ Did the children take responsibility for their own work or activity? ∗ Were children absorbed and engrossed in their work? ∗ Were children strategic learners? ∗ Were the children becoming increasingly collaborative? ∗ Were tasks in the projects challenging and integrative? ∗ How do you use children’s work from the project to assess learning? ∗ How did you facilitate and guide the children’s work? Based on our assessment discussion last June, this year we decided that a major focus of my consulting work with them would be on documentation. We will consider how to use the documentation of project work to help t plan for whole class and differentiated instruction. We also want to use this documentation to help, strengthen the home/school connections and to provide opportunities for children to become more involved in self-assessment and setting personal goals. This entry was posted in Investigating Choice Time: Inquiry, Exploration, and Play and tagged anticipatory web, assessment, car project, Cool Cars, Ellin Keene, Judy Harris Helms, Kathy Collins, Katie Wood Ray, Lilian Katz, Matt Glover, retractile bridge, subway study, web on February 10, 2012 by Renee.